Above: Emergency telemedicine system. Left: Expert annotates patient remotely using Z-Space system. Right top: Annotations are projected on patient using Kinect and projector. Right bottom: Detail of Z-Space patient visualization. The telehealth project uses principles of 3D teleimmersion — a two-way remote communication system in which each party maintains an audiovisual representation of each other — to remotely deliver medical care in various scenarios. 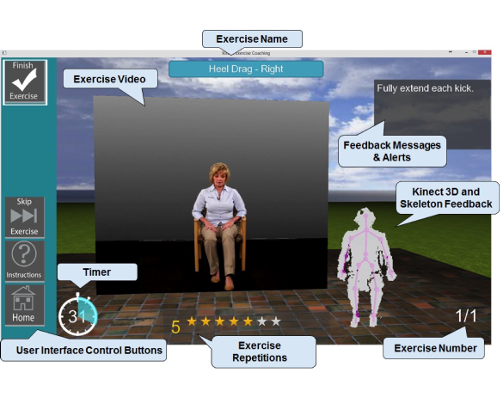 The telehealth framework uses Microsoft Kinect cameras to stream real-time images of each party (e.g., a doctor and a patient) into a 3D virtual environment, allowing them to interact in the same virtual space. 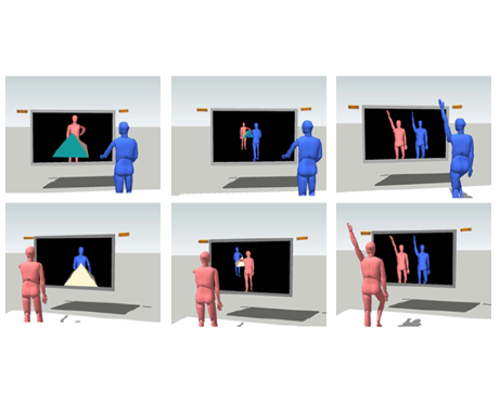 In addition, the Kinect-acquired human kinematics can be used (in combination with other sensors) to obtain quantitative measurements on the performance of the exercises or to assess the patient’s abilities. In many emergency scenarios, medical care is first provided by first responders in the field and later by physicians at designated trauma centers. In the so-called “golden hour,” the efficiency of patient triage and medical transport greatly affects the outcomes of emergency treatment. In current practice, the initial communication and interaction between physician and first responders is limited to voice or video conferencing, and the attending physicians cannot receive more comprehensive, critical patient information. The emergency telemedicine project leverages 3D teleimmersion and augmented reality (AR) technologies to address this communication gap. 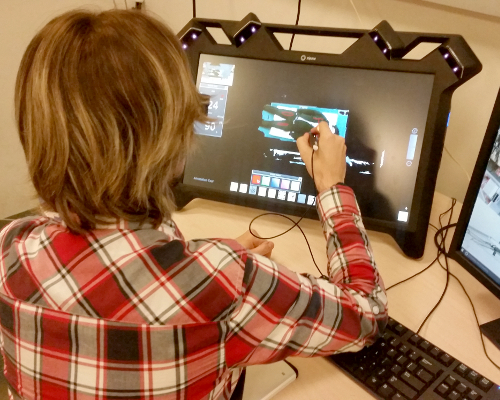 First, a real-time patient data acquisition and visualization module captures patients’ external trauma and vital signals in the field and precisely renders the signals for remote physicians using 3D teleimmersion. Second, an AR module allows physicians and first responders to examine patient data and collaborate on simple medical procedures. Finally, a telemedicine communication module enables secure and robust deployment of the above two modules over long distance through the internet. Research has shown the positive effect of physical activity and exercise on both physical and cognitive abilities. In collaboration with Northeastern University, Oregon Health and Science University, and the University of Washington, our team has developed a semi-autonomous system for exercise for the elderly. The system includes interactive video feedback based on real-time data collected by a Microsoft Kinect camera. During exercise, the system collects kinematic data and provides feedback on the performance to encourage the user. The software was designed in collaboration with an exercise coach to accommodate elderly users with respect to exercise options and user interface.